Every now and then, I get a call about someone famous who grew up in a Sears kit home. In 2009, I was contacted by a big-deal rock star (through his representative). This musician wanted to know if the house he’d grown up in was a Sears kit house! That was a lot of fun, but I also made a promise to not disclose their identity, so that takes some of the zing out of the whole affair! 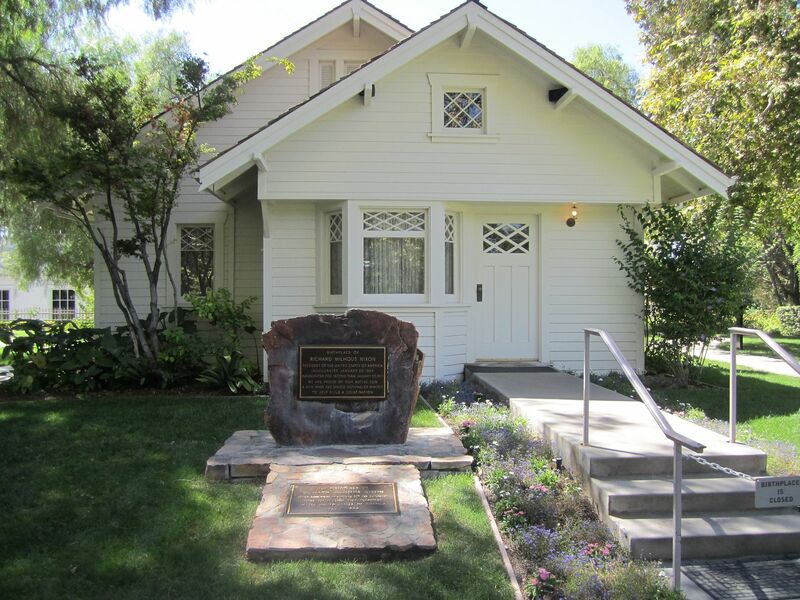 In 2004, someone called and asked me to help identify Richard Nixon’s birthplace home in Yorba Linda, California. I was honored and flattered and excited! I’m sorry to say I don’t remember her name, but she identified herself as an historian trying to document the origins of Nixon’s childhood home in Yorba Linda. After studying every catalog in my possession and seeking help from my buddies, Rebecca Hunter and Dale Wolicki, I came up with a big zero. We kinda sorta decided that the house probably came from the Pacific Ready-Cut Homes company (based in Los Angeles), but honestly, we just didn’t know for sure. Sometimes, the passage of time helps answer the hard questions, as new materials become available and knowledge expands. That has not been the case with Nixon’s home. We have many catalogs for Pacific Ready-Cut Homes (thanks to Dale), but nothing within those catalogs shows a house like this. Based in Los Angeles, Pacific Ready Cut Homes sold more than 40,000 kit homes, and like Sears, they started selling houses in 1908. It’s possible that Nixon’s house came from an early PRCH catalog (which are scarce as hen’s teeth). Richard M. Nixon was one of four sons born to Frank and Hannah Nixon. According to the legend,Frank Nixon built this house in 1913 from a kit on his citrus farm in Yorba Linda, California. Nixon and his family lived in this house until 1922, when they moved to Whittier. While reading up on this house, I stumbled across a wonderful website with many glorious photos. To learn more about Pacific Ready Cut Homes, click here. The photo below came from www.Jackassinahailstorm.com, a wonderful website which I highly recommend! Despite much searching, I was never able to identify the origins of this little cottage. The photo shown above came from www.Jackassinahailstorm.com, a wonderful website which I highly recommend! The Nixon childhood home could be a pre-cut house from an unknown manufacturer. There were innumerable pre-cut housing companies that were in business only a year or two and issued maybe one catalog. I suggest you get us a invitation including travel accommodations to inspect the residence for clues!